A few months on from weaning my little boy off breast milk, and there have been quite a few drastic changes in my life. I breastfed my little one for just over a year, and it is an act that became second nature to me. Giving it up had it’s challenges, and now that I am on the other side, I am going to tell you how my life has changed since then. Clothes. By far, the biggest noticeable change in my life probably took place in my wardrobe. I no longer had to make sure that everything I wore was breastfeeding friendly, and I could wear what ever I wanted without a care in the world! It was exhilarating….for a mother! Freedom. This relates to not having to always be on the look out for baby changing rooms when it is time to feed the little one. Not having to make sure the car is parked close by, if I need to make a quick getaway to feed Baby Z, in case the area we are in is crammed with public. Not having to time myself when I am out, to ensure I don’t miss his feeding time. More baggage. Now that Baby Z doesn’t require milk from me, it means I have to carry around snacks, or meals, in his baby bag. Of course, I must also carry several options in case he is feeling picky. Worry. There is a new mummy worry of mine. Has he eaten enough? Though Baby Z is in fact great with food, and eats pretty much anything I give to him, there is always that mummy worry whether he has had enough to fill his tummy, and also if it was nutritional and balanced enough. This was surely never there when I knew my breast milk was all he needed and had just the right ingredients to keep him alive. Extra cuddles and kisses. I have definitely increased showing affection myself to ensure our bond remains, and this is very much reciprocated by Baby Z. It is just the sweetest moments in the day when Baby Z comes over and plants a big soppy kiss on my cheek, for absolutely no reason. That boy melts my heart every single time. Longer duration of sleep. Baby Z had definitely got into the habit of breastfeeding for comfort, and once he realised he did not need it, he slept for a longer duration during his naps and is currently sleeping through at night. Hooray!! Of course he still has the odd night where he wakes up due to teething pain, but I much prefer the odd night than every single night! Have you recently stopped breastfeeding? Has your life changed in similar ways to mine, or do you think there is something I have possibly missed out in the list above? Please feel free to share your thoughts in the comments section below. Thank you! Glad to hear that there are so many positives to weaning. I’m still feeding my son at 17 months and I’m dreading him giving up as I know I will really miss it. I was the same as you before weaning, but I must say the hugs and kisses more than make up for it. Best of luck with weaning! ?? I love this post. 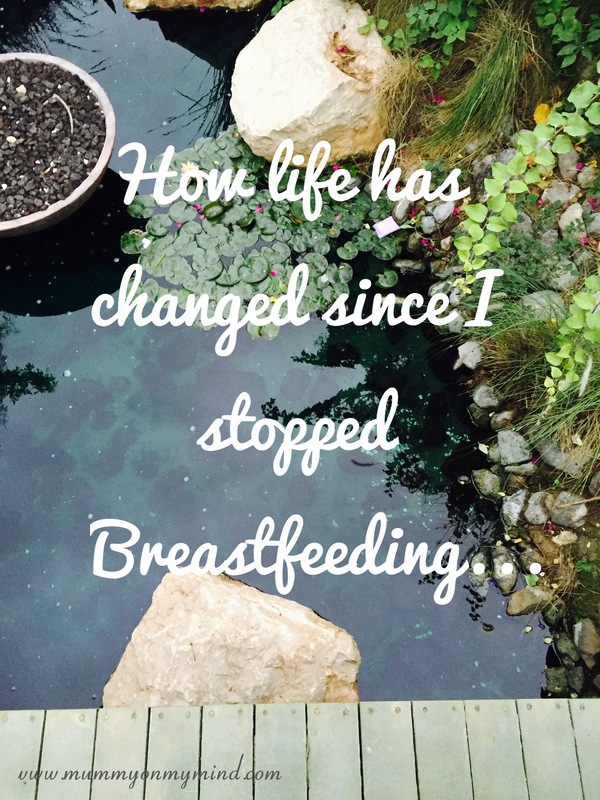 I felt the same when I stopped feeding my little girlie, but now i’m feeding my little boy! I do love it, and I love the closeness. But when he’s done, he’s done, and i’ll look forward to all these things again! Thank you for reading and I’m glad you enjoyed it! I agree, nothing compares to the closeness you feel when breastfeeding your little one! ? Haha oh well I hope things have got better on the sleeping front! Thanks for hosting! ? haha I agree! I was the happiest about being able to wear anything! !